These features are synchronized with the main service order CRM system at the office. If you would like a personal demonstration of MobileDataforce's wide range of work order and service order applications please contact MobileDataforce. MobileDataforce has designed and delivered some of the most advanced automotive solutions for handheld computers that you will find anywhere. 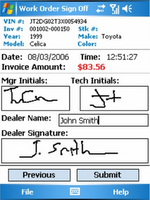 This image shows you an inspection form that allows the handheld computer user to identify any repairs or maintenance that needs to be completed on the interior of a vehicle that was returned from a lease contract. Once the inspection is completed the cost of the maintenance or repair can be factored into the final contract settlement. The repair work can also be scheduled and dispatched as well. This is just one example of the multitude of automotive applications we have developed and delivered around the world. In the past I have written about the advantages of conducting inspections using handheld computers and a mobile software platform. In most of my articles I have focused on the efficiencies from collecting data once, and then synchronizing the inspection data directly to a central database. 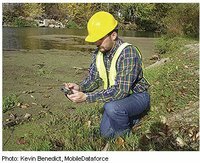 In this article, I would like to highlight the advantages of synchronizing historical inspection data on the handheld computer. I was recently working with a state agency responsible for inspecting professional licenses and premises. In order to perform their tasks, they were required to drive into the main office, rummage through paper files, remove these paper files and load them into a box to take with them to the inspection sites. They would use a carriage with wheels to transport this box to their automobiles. Read through these files to determine any previous non-compliance or failed inspection issues. A simple database synchronization with a handheld computer, laptop or Tablet PC from the field could have completed task 1-5 and 7-9 in a few seconds. MobileDataforce helps both commercial and government organizations improve their inspection processes daily. I have written about other inspection automation and mobilization processes in this recent blog article. I would encourage readers interested in using digital images in work orders and other data collection applications to read this blog article. It talks about how to create a mobile application that allows you to take a digital photo, draw on it and make notes on the photo and then synchronize this edited photo into a central database for record keeping. I have seen this request from companies doing job estimates on handheld computers. They want to take a digital photo and highlight the problem areas. This information gets sent back to the office where a supervisor can review before delivering a final job bid. MobileDataforce is now involved in so many public works and government mobility initiatives that I felt this area deserved its own blog. 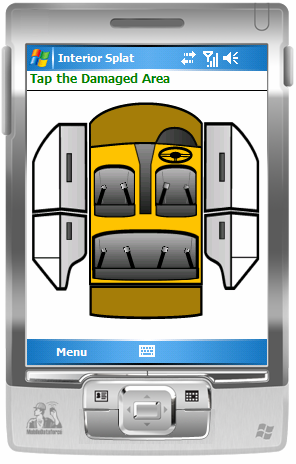 The new blog is called, Mobile Solutions for Government & Public Works. The primary focus of this blog is to share information from mobility projects and initiatives in these arenas. MobileDataforce is participating in our 4th Mobile Technology Conference in the past few months on December 1st in Tacoma, Washington. This series has been very popular with government agencies, utilities and field services companies (.i.e. anyone working outdoors). We have participated in this series in Boise, Salt Lake City, Baltimore and now in Tacoma. They are fun, informative and fast paced. For more details on this upcoming Mobile Technology conference please follow this link. Paper based data collection processes have problems. One of the biggest is the inability of a paper process to ensure that the data collected is relevant, accurate and appropriate. Recently I spoke with a person involved in a data collection project that consisted of 17 data collectors. At the end of the project they reviewed the data on the paper forms and much of it was missing, inaccurate or irrelevant. The project was a complete failure. The screen shot above shows an example of a data collection application with pick lists and database queries. The data collector is limited to selecting pre-designated service categories. Once the category is selected, then a database query is performed that presents only the services related to that category. There are many techniques for ensuring the validity of the data collected, but this example shows how you can limit the selection to at least relevant answers. The other problem the failed data collection project experienced was their inability to review the collected data on a timely basis. The project was over and the data collectors dismissed before the collected data was reviewed and analyzed for accuracy. 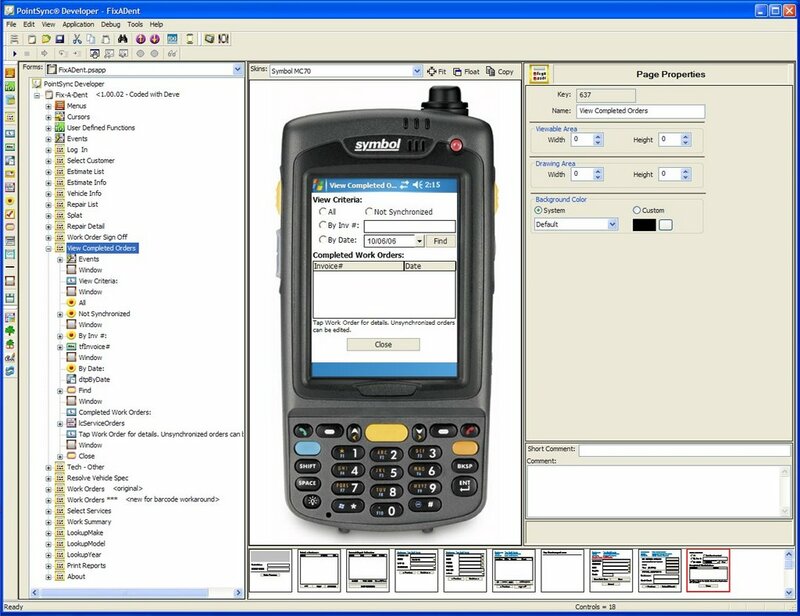 With a data collection solution on a handheld computer that includes integration to a database server, the data can be reviewed as often as needed and with immediate visibility and analysis. His name is Tom Booker. His voice can calm wild horses, his touch can heal broken spirits. That is from the back cover of the book, The Horse Whisperer. I can't do that, but we can talk to cars, trucks and vans and they can talk back to us. We have had the opportunity to work with a company in Vancouver BC, that I have written about in an earlier blog article, that had a requirement to communicate with the vehicle's engine computer. The image to the right shows a cable connection, but we have also connected to the vehicle's engine via bluetooth. What was the purpose of this project? Our customer was converting conventional delivery vans to "hybrid" vans. So during and following the conversion the company was using handheld computers to monitor the engine diagnostics. The mechanics and engineers now can walk up to a car and survey its vitals without lifting the hood. Analysis software on the handhelds can use the data to make recommendations to improve performance and/or configurations. 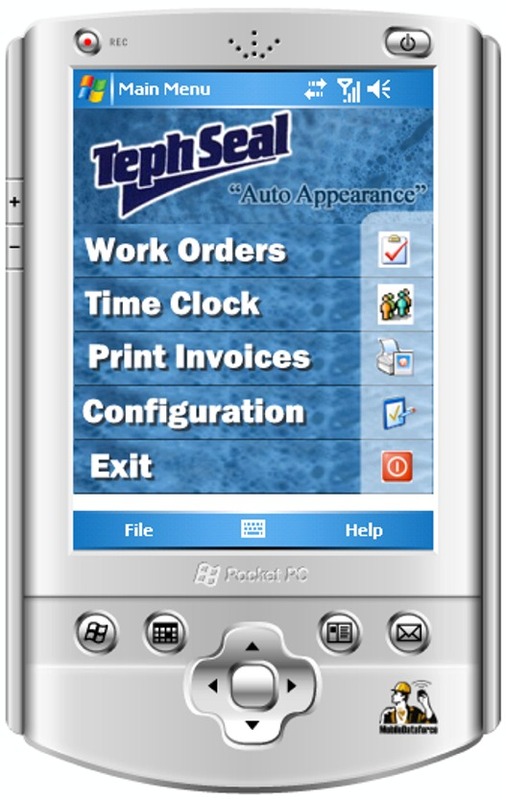 All of these mobile software applications for handheld computers used MobileDataforce's PointSync Mobility Platform for design, development and deployment. Let's discuss just one of these areas in this blog article - Automobile lease returns. What is required in these solutions? Barcode scanning of VINs (vehicle identification numbers) to uniquely identify the returned vehicles. The VIN is often found on the door jam or the dashboard. 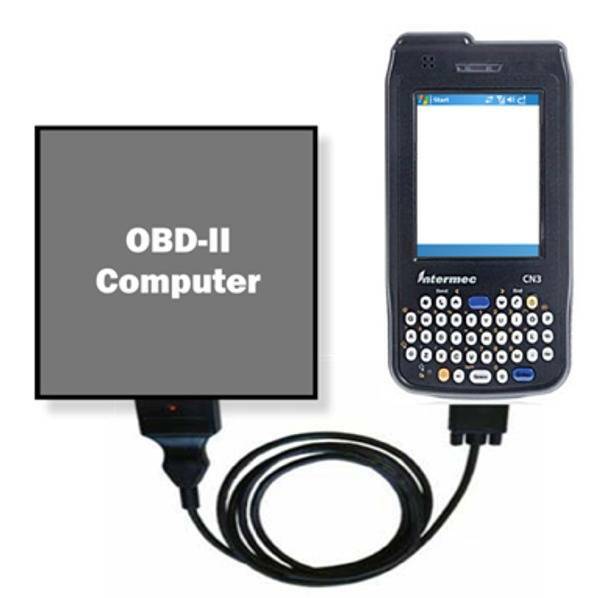 The handheld computer must be able to barcode scan these numbers, identify the vehicle and store the information on a mobile database on the handheld computer. 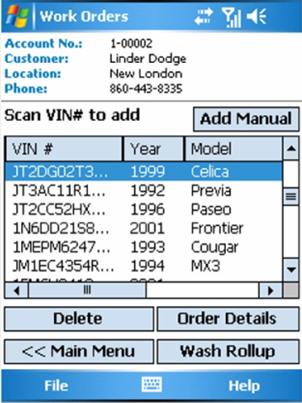 The screen shot above shows a list of scanned VIN codes that were decoded and saved to a automobile inspection application that MobileDataforce designed, delivered and deployed. Database query using the VIN. 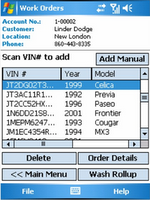 The VIN is used to query the mobile database application on the handheld so the appropriate inspection questions for the appropriate make and model of automobile can be displayed and answered. I wrote more on how to develop customized inspection questions based upon collected data in this recent blog article. 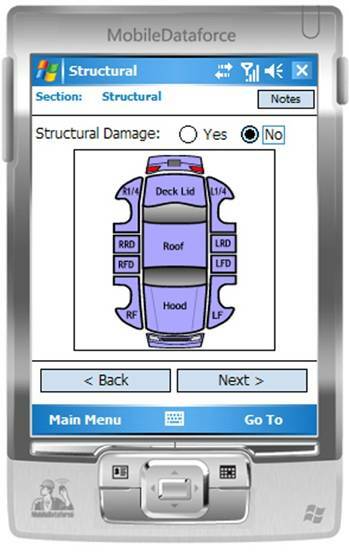 The handheld inspection application is used to identify any damage and maintenance work required to restore the vehicle to resale condition. The damage and repairs can be be added up on the handheld computer and the estimated costs can also be computed on the handheld. 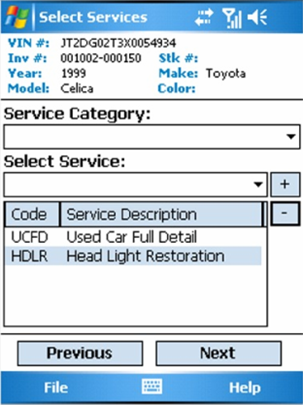 The completed inspections and repair estimates are then synchronized with a central database for all returned vehicles. 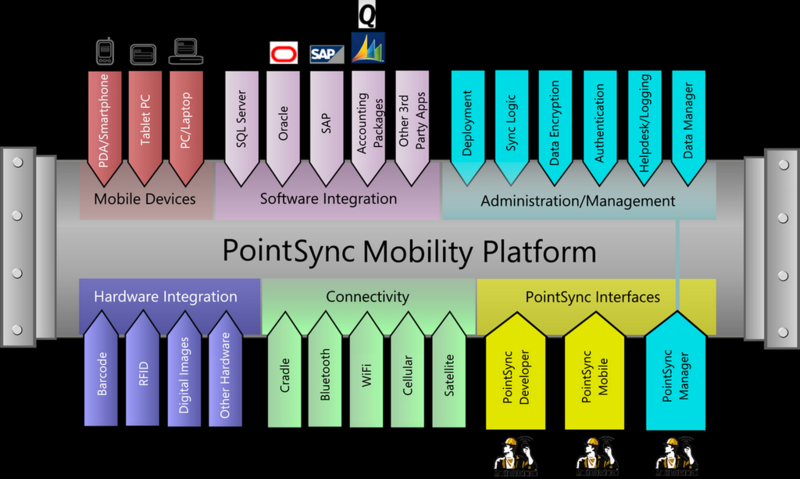 All of the automotive software applications MobileDataforce has designed and developed take advantage of the technology in the PointSync Mobility Software Platform. I have written a number of times about the ability to automate business processes in mobile software applications. This screen shot demonstrates another simple example. In this screen, an estimate of the costs of detailing and repairing an automobile has been determined. 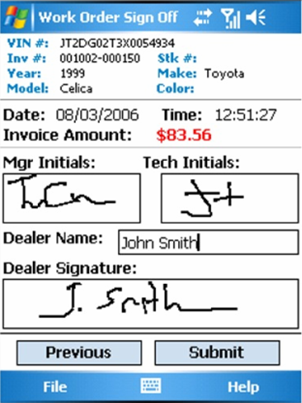 The next step is the service provider's manager must approve and enter his/her initials, the technician that completed the estimate must enter his/her initials and then the auto dealer's manager must sign their name approving the services and cost. These 3 approvals complete the business process that is required in order to start the work and to get paid for the work. This is a simple but important example. If you try to submit this work order without the proper authority, a warning message will pop-up asking for the handheld pc user to complete the business process before continueing. This is another method of helping new users remember how to appropriately complete their work. 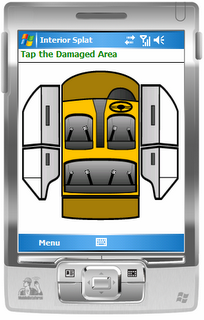 You can build guides, training help and instructions into the handheld pc application - paper forms can't do that. 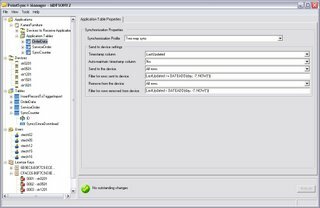 It is very helpful, since much of the work completed on handheld pcs is done remotely, to have instructions, help messages and training pointers built into the mobile application. For each of these questions an icon is available to "click-on" for more detailed instructions on how to answer each question. This is a great training tool and helps standardize all answers to ensure the most accurate job estimates possible. Again, this is a simple example of how a mobile software application can be designed to automate business processes and help the user know what information is required, how to answer the questions correctly and consistently without missing data or forgetting important considerations. 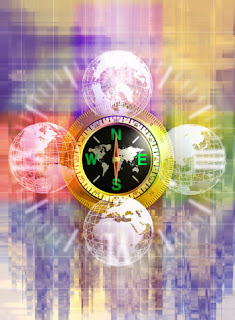 This application was developed using MobileDataforce's PointSync Mobility Platform. My customer support team has been busily working with one of our customers, Teph Seal to mobilize and automate their business operations on auto dealers' car lots. The mobile application is very powerful and is being rolled out to auto dealerships in many locations across the USA at this time. It consists of both mobile applications and a website application that management uses. The environment - mobile work stations on auto dealers' car lots. The purpose - Teph Seal is contracted by the auto dealers to prepare new and used cars for the showroom floor. They detail and repair automobiles so they are ready to show. This solution includes integration with a web application on a SQL database, plus integration with Great Plains accounting software. If you would like to discuss the full range of automotive solutions for handheld computers from MobileDataforce, please contact us here. I have written in more detail about some of the specific applications we have delivered in this article. All of these mobile automobile services software applications were delivered using MobileDataforce's PointSync Mobility Software Platform. 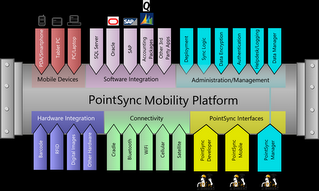 The above diagram represents a mobile software platform called PointSync from MobileDataforce. The concept of a software platform in this discussion means a software application that has many pre-built functions and supports many mobile project requirements out-of-the box. support for Tablet PCs, laptops, Windows CE.NET, Windows Mobile etc. Again the above components and functions need not be developed new for every project. They should be provided for you at the platform level. They can be developed, debugged and tested, added to the platform library, improved over time and expanded so all developers can take advantage of them. Many systems integrators and IT consultants have told me they can not profitably run a mobile application practice if they develop custom mobile applications from scratch. They require a mobile software platform like PointSync to make the projects profitable. No customer wants to pay for custom development, if the code is already available in a tool set at a fraction of the cost. 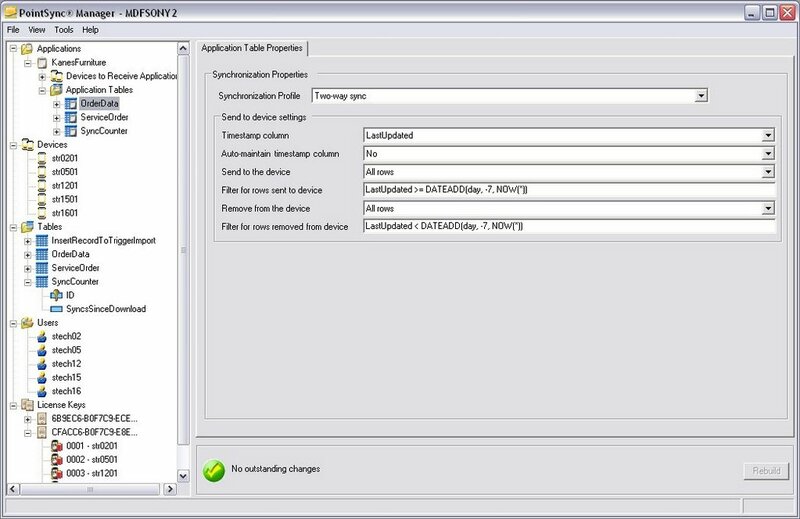 The screen shot above is from MobileDataforce's PointSync Manager. It is the administration screen for managing mobile users, mobile devices, mobile applications, integrated databases, database tables, mobile sycnhronizations and mobile software licenses. The value of using a mobile software platform like MobileDataforce's PointSync, is that these processes and tasks are already developed and available for configuration. In the September/October edition of Public Roads magazine, a magazine published by the Federal Highway Administration, there is an article called High-Tech in the Far West. The article subtitle is - The Idaho Transportation Department taps into wireless technology for collecting and reporting data on maintenance at rest stops. This article describes in-depth the benefits the Idaho Transportation Department received from mobilizing their daily rest area inspection processes with MobileDataforce's mobile software platforms. This article focuses mostly on the benefits of replacing a paper based inspection process with electronic inspection forms on handheld PDAs. I would invite you to read the quotes and comments from the ITD personnel involved in this project. Most often a project touches on all three of these areas. These processes have a few things in common - they often take place out-of-doors and a way from their desktop computer, involve data collecting and reporting in rugged environments. The utility industry also involves the three processes listed above. In this article, I discuss a Power Pole Inspection project delivered to Sho-Me Power. In this article I discuss over 20 inspection applications we do for the electrical industry. I lost my T-Mobile MDA PDA phone last week in the Ocean. I was running along the shoreline with my daughter during lowtide and did not notice my phone was missing. After breakfast, I reached for my phone to feed my addiction to email and it was gone. The tide was now up and our shoreline path was under 4 feet of water. I miss that PDA phone and the gigabyte of files on the mini-SD card. I was at the doorstep of the local T-Mobile store when they opened on Monday morning. My addiction is now fed. A few notes on the MDA. It has a slide out keyboard that is wide enough to comfortably type using your thumbs on the keyboard. When you slide the keyboard out the screen changes to a landscape view that makes it easy to read lengthy emails. It doesn't float, but serves its purpose well in normal conditions. I have used it throughout Europe and Australia when traveling and my email works seamlessly. I am sitting in the airport in Minneapolis as I write this blog. I am returning home from the Maryland State Mobile Technology Seminar where I was the MC for this event. It was great fun. We met with a company that repairs and installs ATMs. They want all of these processes to be mobilized on ruggedized handheld computers. We learned from the ruggedized handheld computer manufacturer - Psion Teklogix, that there are many new and very useful develops coming out this quarter and next. We heard from Verizon Wireless about their CDMA networks and the performance of their data networks. iAnywhere/Sybase presented a great overview of mobile middleware and synchronization processes. We met with a company that develops Asset Management software to monitor and care for trees on government property. They inventory all of these trees and shrubbery and then place them on maintenance and care schedules. VERY COOL! They use GPS, inspection, asset management, inventory and service order processes to accomplish this. These educational conferences take place across the country, so if you would like to be notified of when they are coming to your region please email us. I had the great pleasure of being the keynote speaker at the semi-annual conference for the Washington State Association of City and County IS professionals last week. The venue was amazing out on Orcas Island, and the audience was a lot of fun. 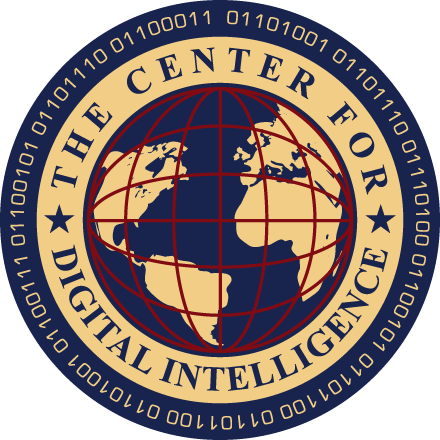 I spoke on the subject of Government Data Collection and Mobilization. We are working with many local government agencies to mobilize their inspections, compliance auditing, service order, maintenance systems and asset management operations. I will be back in Washington State on December 1st speaking at the Washington State Mobile Technology Conference. This conference is an educational event designed to update government agencies, utilities and companies on the latest trends and technologies for mobilizing processes in the field.